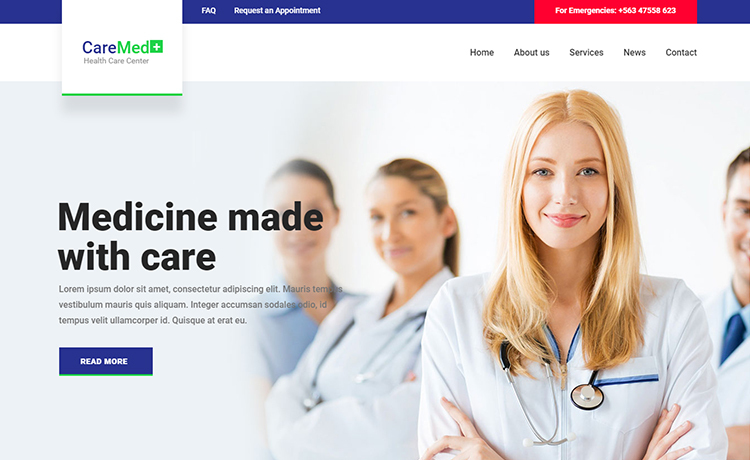 CareMed is a beautifully organized free HTML5 medical template to build a website without any complication. It has Bootstrap 4 and modern tech support. This free HTML5 medical template provides you with lots of options and features to craft your medical website efficiently. Likewise, you can use CareMed template in medical and healthcare fields like hospitals, clinic, health NGO, and doctors. It has Bootstrap 4 support which ensures a superb quality. The sticky navigation, followed by a top contact bar, presents a great deal of user experience. Afterward, you can satisfy your visitors with a nice full-width header which includes a warm button with on-hover effect. However, you can add the information for working hours, appointments, and emergency contact on the next section. Let the visitor explore the entire website by utilizing the multi-page facility. Furthermore, there is the feature section designed with custom icons and ready to put special services to check out easily. Then the next section is the about section where you can add full information and details. With the circular progress bar, you can show your organizations achievements. Similarly, a client can add reviews in the testimonial section about the services if they are happy or not. Additionally, descriptive footer, social media icons, on hover buttons and more make this free HTML5 template looks stunning. Keep in touch with the patients via the contact page integrated with Google maps. Besides healthcare free website templates, you can look for other free Bootstrap templates on our site. Choosing CareMed for making a medical website is a wise decision. But if you want to explore more, then visit the quality checked section for more beautiful and high-performance templates. You will be simply delighted.